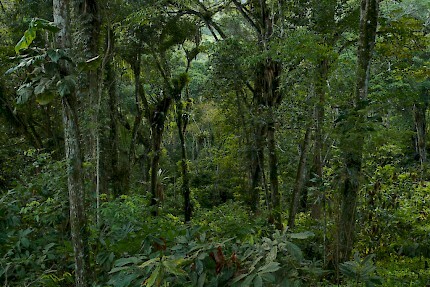 Home > Brazil > What is Agroforestry? Before travelling to the farm Fazenda Almada in less than two weeks to start our tree planting project, we want to shortly describe Agroforestry. The word combination already gives it away, and the concept is as easy as it sounds – you include trees and forests in the agricultural production of our food! With increased industrialization, the 20th century witnessed unprecedented logging of areas the size of European countries to clear space for large scale farming. These practices allow for many thousands of cattle on one farm and dozens of hectars (especially in the Americas) of monocultures, mostly soy beans and maize. While the benefits of cheap mass production that can be scaled up is clear, so are the drawbacks. In the backlight of climate change and an emerging ecological crisis, industrial agriculture offers no sustainable solution. In the 1970s activists, farmers, policy makers and citizens discovered the at times catastropic consequences of this large scale logging and monocultures and actively pushed agroforestry, for instance by establishing the International Research Center for Agroforestry in Nairobi. The respected institution has since then lobbied at different levels for more biodiversity by planting trees, funded projects (see video) and published many studies. There is different ways of establishing agroforestry, or agro-sylviculture, but they all include trees in agricultural production. For instance, one plants native trees on pastures to provide shade, strengthen the soil and improve the local water cycle. Other practices include cross-cropping, where you plant many different plants together, alley-cropping and crop-over-tree systems. While the economic challenges of agroforestry seem to be obvious as you cannot use industrialized machinery such as very big harvesters, there are also clear benefits. Involving trees and native flora in your farm improves biodiversity, environmental standards, and food qaulity, it combats climate change, increases local resilience, and studies even found that agroforestry has social and spiritual benefits, i.e. for indigenous people in Latin America. Without a doubt, these systems all represent a commitment to bringing sustainable development principles to agricultural production. The food we eat and the juice we drink have to be produced somewhere, let’s make sure that place improves the social and ecological standards of the community. At times we might have to pay more for a fruit, vegetable or meat produced in agroforestry. However, it is still less than the price we pay for ruining the environment. During our tree planting project in July, we want to be part of the trend towards agroforestry. We want to share the knowledge with the local community, learn from the farmers and their experience and simply enjoy the fantastic nature of Bahia! Be part of our project and follow this blog and facebook.